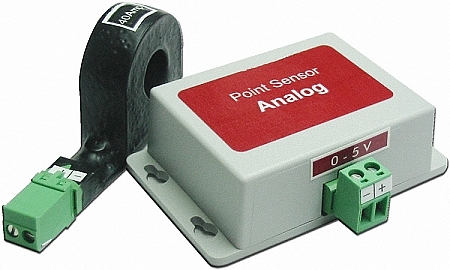 The Point Sensor Power Monitor wireless transmitter is a battery operated 12 bit analog-to-digital converter with a microprocessor controlled 418 MHz or 433 MHz. FCC certified radio transmitter. The Sensor has an on board time of day clock that allows it to spend most of the time in a low power quiescent state. At predetermined time intervals the clock will wake up the onboard microprocessor. Unique serial number information is read from a Dallas Semiconductor 1-wire digital device and analog data is read from a 12-bit analog to digital converter. This information is combined with a CRC-16 error check and transmitted in a very short data packet that results in a transmitter on time of only 15 milliseconds. This architecture allows the Sensor to consume very low energy resulting in a battery life of up to 5 years.